To book the Burtle Silver Band for your event, for general enquiries, to join the band or provide feedback please complete the form below. Where did you hear about Burtle Silver Band? Burtle Silver Band rehearses every Thursday evening, 7.45 - 9.30pm at Burtle Village Hall. The village hall is situated on Burtle Road, which is the main road through Burtle, on the western outskirts of the village. 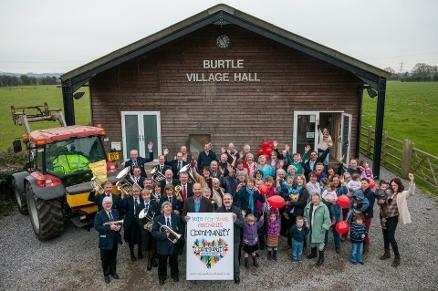 The photograph below was taken outside Burtle Village Hall at the launch of the Community South West project in February 2013, where the band provided some musical entertainment.